For more than 48 years, the Brookings Arts Council (BAC) has pursued its mission of "encouraging community connections through the arts by providing a supportive environment for awareness, appreciation and participation." The BAC strives not only to entertain and educate the public, but also to increase opportunities for artists to gain recognition. Annual Juried Art and Photography exhibitions bring together the work of many regional artists, from the experienced and respected to the new and promising. The BAC also provides a platform for the community's youngest artists by partnering with area schools to sponsor exhibits of work by students from kindergarten through high school. 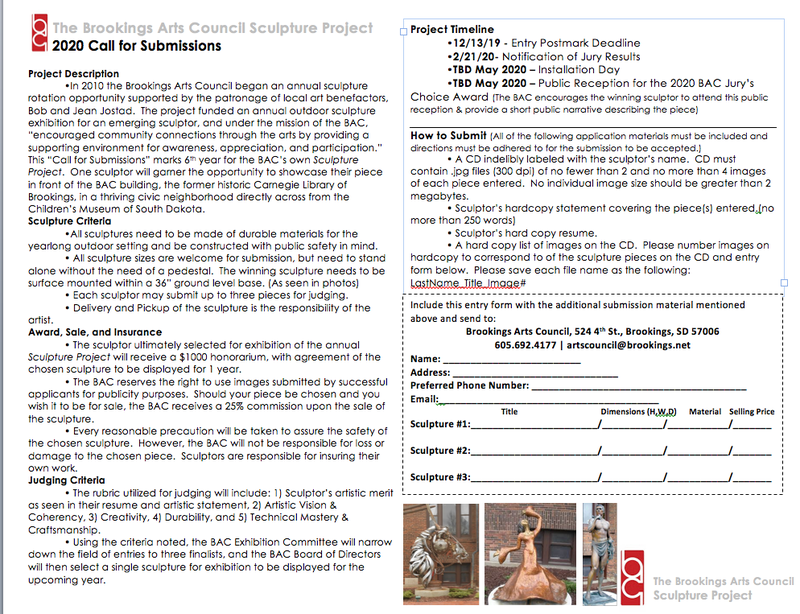 Exhibits, education, interaction, creativity-in all forms are what the Brookings Arts Council is about! We are ART… Brookings Arts Council, making art happen! Located in the historical Community Cultural Center buildingat 524 4th Street just south of the Children’s Museum.